Symons cone crusher is usually used in secondary crushing, tertiary crushing, standard type generally used for Coarse crushing and the short head type is used in finely pided; Symons cone crusher is suitable for crushing hard and medium hard ore and rock, etc. such as iron ore, copper ore, limestone, quartz, granite, sandstone, etc. ; currently Symons cone has been widely mining, construction, chemical, electric power, metallurgy and silicate industry. SDY series Symons cone crusher mainly consists of frame part, transmission part eccentric Ministry, the Ministry of bowl bearings, bearing sleeve Ministry Ministry of adjustment sleeve, the spring part and provide lubricant lubrication oil station and other components. 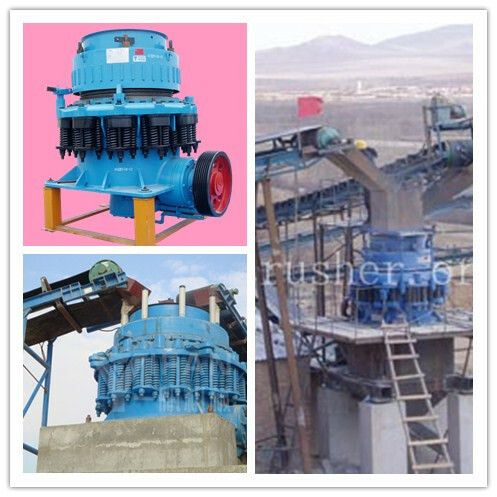 SDY series Symons cone crusher reasonable structural design, high production efficiency. Using the design of high precision bowl bearing reserves and centralized lubrication systems and novel stem oil seals dust control system. When you need to adjust the discharge opening size can be adjusted by hand to promote the winch. The machine also has a thing when it is not broken into the crushing chamber, spring safety devices to protect equipment from damage characteristics. When cone crusher work, motor drives the eccentric through the pulley, drive shaft and a rotating set of gears, crushing cone axis moving in force under the spin pendulum movement to do so crushing wall of rolling acetabular wall sometimes close, sometimes far away, ore crushing cavity constantly being squeezed and bent and broken. The continuous rotation of the spring cone crusher motor, the discharge process and the crushing process alternately along the working surface of the material continuously, and high productivity. Material sandwiched between two cones, by extrusion, bending and shearing, crushing easier, lower power consumption. Crushing particle size more uniform, cubic shapes, moving cone wear work surface more uniform. Dtructural profile, cone crusher main frame structure, the horizontal axis, moving cone, balance wheel, eccentric, the broken wall (fixed cone), under the crushing wall (fixed cone), fluid couplings, lubrication composed of several parts of the system, hydraulic system, control system and so on. Moving cone and fixed cone is upright, dynamic cone swing when, in the crushing chamber near the discharge port, there is a gap between equal parallel with dynamic cone and fixed cone, the finished Liaoduo uniform. Inlet size is not capable of handling the material are broken after the first. Symons cone crusher adopts two dry oil or water seals, dust and impurities can not make the body into the man-machine, thus ensuring clean run edible vegetable oil, extending the sliding bearing, thrust ball bearing life, making the reliable operation of the machine.